No links today. 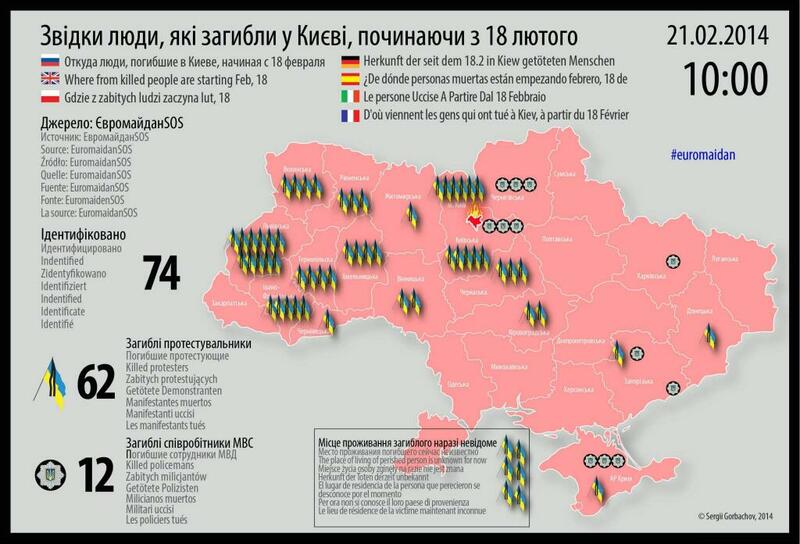 The only thoughts are with those on the Maindan who gave their lives to the future of Ukraine. I am happy that we have managed to overthrow the criminal regime that had been built over recent years. With the evidence transpiring from the documents found at Mezhyhirya and firms affiliated with the clan, the scale of corruption and law abuse is plainly incomprehensible. As with everything in our life, the lessons we should draw from the situation we’ve been through, are of the equal importance as the feat that has just been accomplished. The change is not over yet. If people stop now, it would bring the same profound disappointment and disenchantment as Yushchenko brought us after his election. There is no other way except sweeping lustration. Police, prosecutors, judges, and corrupt MPs are the first on the list. Life is rough and often concealed by decoration. As the events unfolded over the past 3 months, I clearly remember thinking many times: “It can’t be worse, he will not dare to exacerbate situation further, it’s against his own good”. And every time I thought it, situation turned even worse, and every time he dared to take that step to aggravate events further. Does this need an explanation? We are divided, and refusing this is a delusion. Delusion is always a mistake, it’s a wilful ignorance. I bet most of people’s thoughts about Yanukovich were delusions. Like that he would stop, he would hold an election in 2015, etc. Believing in a black-and-white world is also a delusion, world has infinite shades of grey, and virtually no white and no black objects. We have to aspire to better understanding and boarding horizons of our world-views. This is a foundation for solid civil society. We need to strive for (and learn, and teach) critical thinking. We need to learn to live with people who don’t share our beliefs without hatred. People will be manipulated again and again, and the only way to fight this is proper education. The history tells us: “Revolutions are made by romantics, but their fruits are reaped by scoundrels”. Will this time be different? I really hope it will. This entry was posted in Articles and tagged Maidan, Politics on February 23, 2014 by ivan.